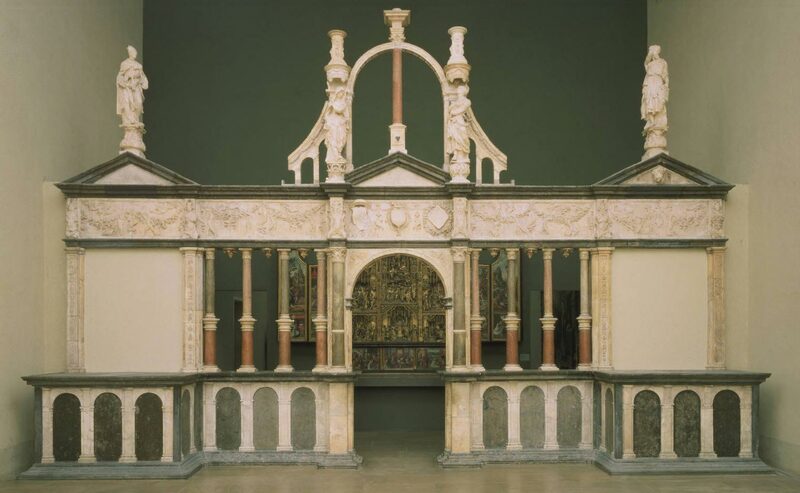 This screen, the central interior element of the chapel at the château of Pagny, is one of the finest structures surviving from the French Renaissance. The coats of arms over the central archway are those of Cardinal Claude de Givry, Archbishop of Langres; Philippe Chabot, admiral of France and governor of Burgundy; and Françoise de Longvy, wife of Chabot, niece of Givry, and the heiress of Pagny. While Chabot owned the château, the archbishop played a role in the decoration of the chapel. The statues that stand above at left and right are probably Saints Claude and Philip. At center are the Virgin Mary and Saint John. Originally, a stone sculpture of Christ on the cross stood on the column capital at the top of the arch. During the 1530s, the chapel at the château of Pagny was embellished in successive redecoration campaigns by Philippe Chabot de Brion, admiral of France and governor of Burgundy, and his uncle by marriage, the cardinal of Givry (see also). One of the finest Renaissance monuments outside France, the screen originally crossed the chapel's nave in front of the main altar. The severe Italianate design of the choir screen recalls the remarkable contemporary façade of the church of Saint-Michel in Dijon, while the frieze, notably fanciful in composition and delicate in execution, demonstrates a direct knowledge of the styles of the Italian artists Rosso Fiorentino and Francesco Primaticcio, then working for François I of France at Fontainebleau. 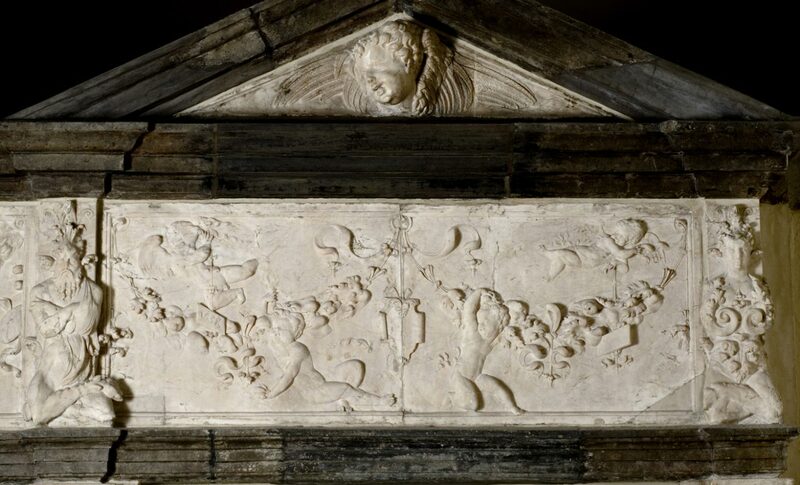 The frieze contains heraldic references to Chabot and the cardinal's family. The four statuettes of saints above are among the most sophisticated sculptures of their time. Appearing to move gracefully despite complicated poses and costumes, they are brilliant examples of the refined art that resulted when French artists--here yet unidentified--melded a late Gothic Northern European heritage with the still developing Mannerist style imported from Italy. Dean Walker, from Philadelphia Museum of Art: Handbook of the Collections (1995), p. 124.